A new app using lichens to assess atmospheric nitrogen pollution effects has been developed by the Centre for Ecology & Hydrology (CEH). By identifying the presence or absence of nitrogen sensitive and non-sensitive lichens on tree trunks and branches users can get an estimate of how polluted an area is. 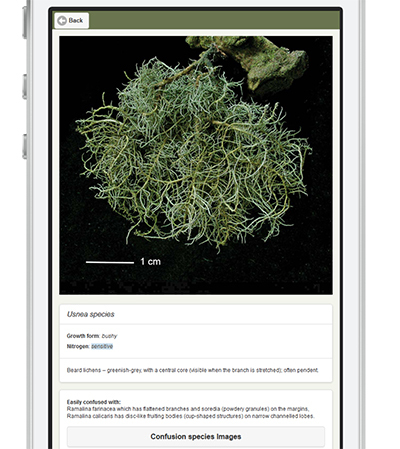 The Lichen App is downloadable to mobile phones for use in the field. It is based on a field guide produced in collaboration with Natural History Museum, the University of Nottingham, Sniffer, Joint Nature Conservation Committee, Scottish Natural Heritage, Scottish Environmental Protection Agency and Northern Ireland Environment Agency, and published by the Field Studies Council. Excess nitrogen can cause eutrophication and acidification effects on semi-natural ecosystems, which in turn can lead to species composition changes and other damaging effects. Species adapted to low nitrogen availability are at a greater risk from this effect including many slow-growing species, notably lichens and mosses. Recent research on UK oak and birch trees identified a set of ‘indicator’ lichens (sensitive and tolerant) with clear responses to increasing concentrations of atmospheric nitrogen pollutants. By identifying the presence or absence of nitrogen sensitive and non-sensitive lichens on tree trunks and branches you can get an estimate of how polluted your area is. Emphasis has been placed on the use of indicator lichens that do not require identification at the microscopic level and that are least likely to be confused with other species. Data collected will be deposited into the Biological Record Centre’s data warehouse linked to the iRecord system. Results will be available and mapped online with coloured map-markers representing the four pollutant zones. The Lichen App was developed by Karolis Kazlauskis, Bill Bealey and Elin Roberts at the Centre for Ecology & Hydrology. The online field guide and user manual can be downloaded at the lichen field manual home page. Users wishing to do the survey without the use of a mobile device (via pencil and paper) can also use these resources. These results can be inputted manually into an online web form and sent to the data warehouse.